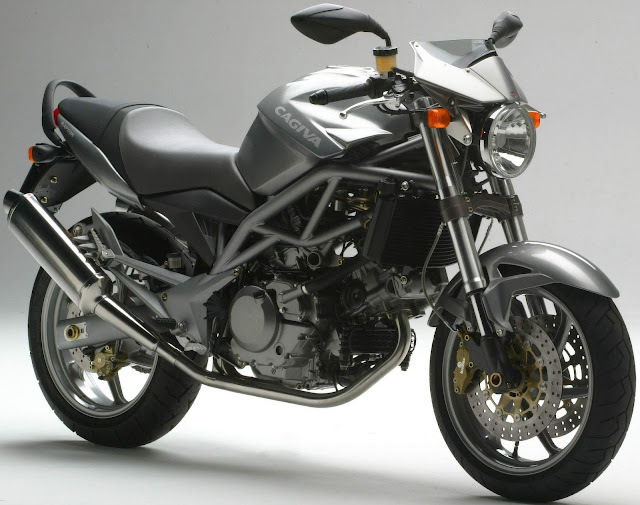 The V-Raptor was a benchmark bike for its makers. The Cagiva brand-name may not have quite the cachet of, say, Ducati or MV Agusta. But Cagiva owned both those two giants, back in the day. And Aermacchi Harley-Davidson can be added to that list. For, it was in the latter's old factory - in Varese, Italy - that the Cagiva wheels were first set in motion. Claudio and Gianfranco Castiglioni were the firm's founding fathers. The V-Raptor was designed by Miguel Galluzzi. He had previously penned the Ducati Monster. A 996cc V-twin - borrowed from Suzuki's TL1000S - was duly dropped into Galluzzi's creation. The result was a good-looking bike, with a top speed of 150mph. Given that it was far from the world's biggest manufacturer, Cagiva made a big impact on the Nineties motorcycle racing scene. Certainly, the Cagiva team was not afraid to square up to the Japanese 'big boys' - and, occasionally, give them a bloody nose! In '92 and '93, Cagiva won top-flight GP races. Notably, American rider John Kocinski did the honours on home soil. In '94, Cagiva topped the podium enough times to be leading the GP world championship, at one point. Sadly, that same year saw them retire from racing. Financial gremlins had lobbed an immaculately clean spanner in the works. In road-going trim, though, Cagiva motorcycles continued to impress. The V-Raptor, in particular, was given a rapturous thumbs-up! Hi! I'm not aware of any SEO plug-ins ... unfortunately! We're all in the same boat ... it's far from easy, that's for sure!